emmetoneill added a comment to D19554: Feature: Simplex Noise Generator. Cool. We'll sort out the dependency and license stuff and push it. emmetoneill awarded T8576: Improve Brush Opacity handling. a Love token. emmetoneill added inline comments to D16833: [WIP] Further Color Picker Upgrades, Fixes and Refactors..
emmetoneill updated the diff for D16833: [WIP] Further Color Picker Upgrades, Fixes and Refactors..
emmetoneill added a comment to D16833: [WIP] Further Color Picker Upgrades, Fixes and Refactors..
emmetoneill added a comment to T10178: docs.krita.org organization and structure for future changes. Hey all. I spent a few days thinking about this thread. emmetoneill updated the summary of D16833: [WIP] Further Color Picker Upgrades, Fixes and Refactors..
emmetoneill requested review of D16833: [WIP] Further Color Picker Upgrades, Fixes and Refactors..
emmetoneill committed R37:3f6177619dcc: Improved responsiveness of moving large SVG objects. (authored by emmetoneill). Improved responsiveness of moving large SVG objects. emmetoneill added a comment to T8708: Color Picker Improvements and Refactoring..
Add of adjust a KisSignalCompressor with configurable sensitivity. emmetoneill committed R37:e9b382d7ffd4: Restored ability to pick colors from the Text Editor. (authored by emmetoneill). Restored ability to pick colors from the Text Editor. emmetoneill committed R37:ce8254dc5ea7: Color smudge brushes now work properly in combination with alpha lock. (authored by emmetoneill). Color smudge brushes now work properly in combination with alpha lock. emmetoneill committed R37:ffb7d98ce4b2: Fix regression in node undo/redo. (authored by emmetoneill). Fix regression in node undo/redo. emmetoneill committed R37:20406f0cb05f: Fix KisImageLayerAddCommand Redo/Undo Updating Bug. (authored by emmetoneill). Fix KisImageLayerAddCommand Redo/Undo Updating Bug. emmetoneill committed R37:189679b7108a: Avoid blending bug on first color pick. (authored by emmetoneill). Avoid blending bug on first color pick. emmetoneill committed R37:d056aac2e60d: Fixed Selection Tool Crash on View Change. (authored by emmetoneill). Fixed Selection Tool Crash on View Change. emmetoneill committed R37:a28ce83a44f8: Fix missing shortcut from Fill Tool tooltip. (authored by emmetoneill). Fix missing shortcut from Fill Tool tooltip. emmetoneill committed R37:83a05fffb07d: Prevent opening filter dialogs on non-editable layers. (authored by emmetoneill). 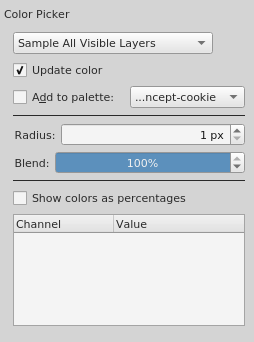 Prevent opening filter dialogs on non-editable layers. emmetoneill committed R37:4976def25dc7: Color picker now correctly picks alpha values. (authored by emmetoneill). 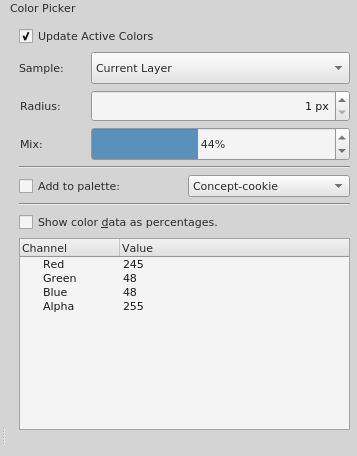 Color picker now correctly picks alpha values. emmetoneill added a comment to D15755: Global Kinetic Scrolling. emmetoneill added a comment to M137: Consolidated brush editor UI design ideas. emmetoneill added a comment to M138: Krita: Multi-target Exporter. emmetoneill created M138: Krita: Multi-target Exporter. emmetoneill resigned from D15755: Global Kinetic Scrolling. 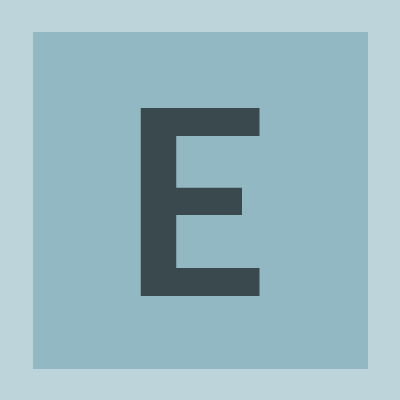 emmetoneill added a member for Bugsquad: emmetoneill. emmetoneill committed R37:6a737a98957a: Fixed SegFault in LibKis Node mergeDown (authored by emmetoneill). emmetoneill updated the task description for T8708: Color Picker Improvements and Refactoring..
Reddit user Rous2 suggested the possibility of pressure sensitive color picker mixing (blend). emmetoneill added a comment to D13441: Manual: Timeline Docker - Edit and Update for v4.1 . emmetoneill updated the diff for D13441: Manual: Timeline Docker - Edit and Update for v4.1 . Installed Sphinx. It was super easy to get working (on Linux, at least), just install and build. Overall Sphinx has been great to work with! Much improved workflow, in my opinion. emmetoneill requested review of D13441: Manual: Timeline Docker - Edit and Update for v4.1 . emmetoneill claimed T8973: 4.1 Timeline improvements. If you want to take a stab at it, the contributor's manual (readme) has instructions on how to contribute to sphinx. You can also write up the text here, in which case I'll port it. emmetoneill added a comment to T8973: 4.1 Timeline improvements. Hey Wolfthera, I'd like to help with this if possible. Is this the only page that needs to be updated? I'd be happy to write about the new features as of 4.1 and edit what's already there. emmetoneill closed D13376: Bugfix: Animation Timeline's "Remove Frames and Pull" now removes expect frames consistently.. Fixed and built the tests, and then pushed! Closing. Thanks again, Dmitry. emmetoneill committed R37:b2ae65a74562: Fixed Timeline's "Remove Frames/Columns and Pull" Actions. (authored by emmetoneill). Fixed Timeline's "Remove Frames/Columns and Pull" Actions. emmetoneill updated the summary of D13376: Bugfix: Animation Timeline's "Remove Frames and Pull" now removes expect frames consistently..
emmetoneill requested review of D13376: Bugfix: Animation Timeline's "Remove Frames and Pull" now removes expect frames consistently..
emmetoneill closed D12977: Refactor: Animation Timeline Code Reuse and Menu Simplification. emmetoneill committed R37:7030f6a906da: Animation Timeline Refactor + Bugfix (authored by emmetoneill). emmetoneill updated the diff for D12977: Refactor: Animation Timeline Code Reuse and Menu Simplification. Resolved the regression caused by my previous patch 7c639729115b3a3bb20e1b0a1046c1bfbb6f41fe, which caused only one frame to be added by the "insert frames/columns left/right" actions regardless of number of selected frames. These actions now correctly insert new blank keyframes on the correct side of the cursor based on the number of currently selected frame slots. emmetoneill added a comment to D12977: Refactor: Animation Timeline Code Reuse and Menu Simplification. Alright! I'm looking into it right now. Here's an update patch that fixes the menus. I popped a few more of the one-liners that call more general member functions into the header. I also fixed a tiny bug with the separators in the insert frame/hold columns menus and cleaned up some unused headers. emmetoneill added a comment to T3496: Cycles in animation. I assume in your example the run cycle is drawn somewhere outside the range of frames you describe here. edit the frames of a cycle. Changes should be reflected in the repeats. Hey everyone, I just wanted to share a possible design mock-up for animation cycles that I put together. emmetoneill added a comment to T3587: Open as layer command line parameter. emmetoneill updated the summary of D12977: Refactor: Animation Timeline Code Reuse and Menu Simplification. Added code-reuse refactor for hold frames and hold columns. emmetoneill requested review of D12977: Refactor: Animation Timeline Code Reuse and Menu Simplification. emmetoneill added revisions to T8652: Krita 4.1.4 Release Task: D11895: Feature: Color Picker Blending, D12843: Animation Timeline Docker: Insert Keyframes with Timing. .
emmetoneill added a task to D11895: Feature: Color Picker Blending: T8652: Krita 4.1.4 Release Task. emmetoneill added a task to D12843: Animation Timeline Docker: Insert Keyframes with Timing. : T8652: Krita 4.1.4 Release Task. emmetoneill edited projects for T8708: Color Picker Improvements and Refactoring., added: Krita: Abyss; removed Krita. emmetoneill added a comment to T8652: Krita 4.1.4 Release Task. Hey boud and wolthera. Would it be ok to add these feature revisions to the task? They're both in master now. emmetoneill triaged T8708: Color Picker Improvements and Refactoring. as Low priority. emmetoneill updated the summary of D12953: Bug fix: Ctrl-activated color picker no longer glitches out when double clicking with a mouse..
emmetoneill added reviewers for D12953: Bug fix: Ctrl-activated color picker no longer glitches out when double clicking with a mouse. : Krita, rempt, dkazakov. emmetoneill requested review of D12953: Bug fix: Ctrl-activated color picker no longer glitches out when double clicking with a mouse..
emmetoneill added a comment to D12941: Refactor: Unified Color Picker Code & Removed Some Duplication. emmetoneill updated the summary of D12941: Refactor: Unified Color Picker Code & Removed Some Duplication. emmetoneill requested review of D12941: Refactor: Unified Color Picker Code & Removed Some Duplication. emmetoneill updated the diff for D12843: Animation Timeline Docker: Insert Keyframes with Timing. .
Stupid mistake there, sorry about that! Seems to be all fixed up now and working correctly. Thanks for catching that, Dmitry. emmetoneill added a comment to D12843: Animation Timeline Docker: Insert Keyframes with Timing. .
@dkazakov, thanks for the kind words and feedback. I'm glad you like it. I went ahead and made the changes that you requested and I actually properly tested the column insertion this time! Even though I saw the code for columns before, I actually wasn't fully aware of / didn't fully understand what the feature was or how to use it because I never tried clicking on the timeline. That's my mistake though, as it's a useful feature! Fixed bug that caused unwanted creation of columns. Whoops! Added timing and GUI changes to column insertion. emmetoneill created T8708: Color Picker Improvements and Refactoring..
emmetoneill updated the summary of D12843: Animation Timeline Docker: Insert Keyframes with Timing. .
emmetoneill added a comment to T8548: Popup palette improvements. emmetoneill abandoned D12815: Feature Discussion: QuickZoom and Popup-Palette Button Changes..
emmetoneill requested review of D12843: Animation Timeline Docker: Insert Keyframes with Timing. .
emmetoneill added a member for Krita: Stable bug fixes: emmetoneill. emmetoneill added a member for Krita: Website and Translations: emmetoneill. emmetoneill added a member for Krita: Next Features: emmetoneill. emmetoneill added a member for Krita: Manual: emmetoneill. emmetoneill added a member for Krita: Abyss: emmetoneill. emmetoneill accepted D12682: Animation timeline improvements and added "empty frame" concept to data model.